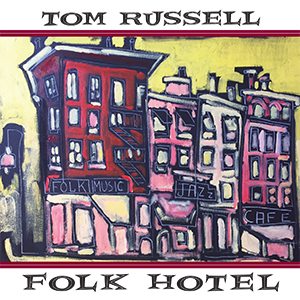 Tom Russell releases his new album on 8th September. It’s the latest in a long line of albums in a career that stretches for over forty years. His songs have been recorded by many artists including Nanci Griffith and Johnny Cash, and when not writing and recording his own albums he’s written several movie soundtracks, and is also an accomplished painter. Known as both a folk singer and one of the founders of the Americana genre, he’s got a distinctive voice, and that voice alone gives the album a strong Americana feel. The subject matter of the songs is varied, covering a song about New York’s Chelsea Hotel, a journey from El Paso to Santa Fe, a cowboy song about Ian Tyson refusing to “leave his old horses”, a song about Tom meeting J.F.K. and more. This really is a superb album. It’s deceptively simple with most of it being just him singing and playing acoustic guitar, but it’s so well done that you find yourself being drawn in and really listening to the stories the songs tell. Before you know it you’ve listened to not just one song, but the whole album – probably several times. A fantastic album for fans of Folk and Americana.